Please let hyper loops be real. Please, please please let hyper loops be real. The funny thing is, I found this other article about why hyperloops won’t work. But I think there are a number of problems with this. First of all, many of the people flying between Dallas and Houston are not actually ending up in those cities; they’re going somewhere else, because Dallas is a major hub. When I want to fly up to see my family in upstate New York, I don’t take Amtrak to Penn Station and then trek out to LaGuardia, even though I much prefer rail travel to air travel. So high speed rail doesn’t readily substitute for air travel unless you have a lot of connections running out of Dallas. I don’t think it’s an accident that the two places in America where rail kind of works–the northeast corridor, and the LA-San Diego route–are coastal runs where the regional links run down a basically straight line. And the reason that they are conveniently in a straight line is that both regions happen to be sandwiched on a narrow strip between the coastline and a big mountain range that limited inland development during the formative years. In the middle of the country, where you need to add an east-west axis to your planning, things rapidly get more expensive. The other reason I don’t think that rail is going to compete with air in most places is the very thing that makes air travel so environmentally problematic: frequency of service. For high speed rail–or any sort of rail, really–to be an environmental boon, the trains have to run pretty full. But wait, you say. Ms McArdle (yes, the same Ms McArdle) is talking about high speed rail, not hyperloops! 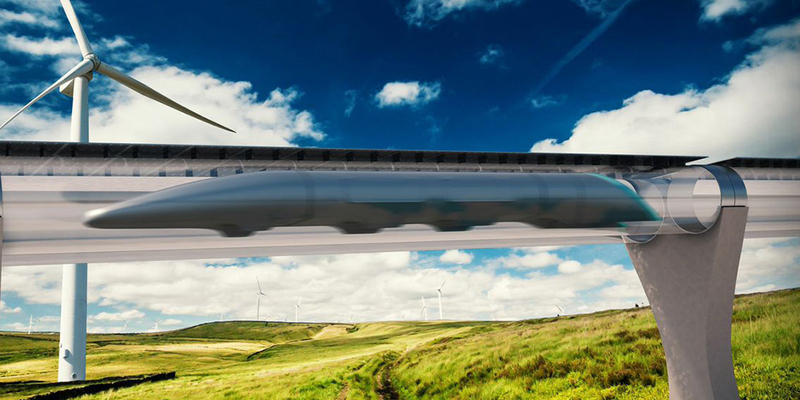 From a technological perspective, hyperloops are new and cool and really awesome and totally not trains. But from a business perspective, it’s just a glorified train. It moves a lot faster and it’s more efficient, but those aren’t really the problems with trains. Maybe speed, but we already have a faster-than-trains alternative: it’s called the airplane, and there’s already a lot of infrastructure in place for it in the US. But trains are already pretty efficient, especially electric trains. The reason we don’t have more of them in the US is because the infrastructure cost is too high. For hyperloops to become a thing (outside of a few limited areas), there would have to be trillions (yes, trillions) of dollars worth of loop built. If you don’t believe me on the cost, check out the latest highway bill – and remember that that’s just for maintenance, not for building the whole Interstate Highway System from scratch. Trillions of dollars isn’t exactly the kind of fixed cost that you recoup quickly or easily. What about the speed? Well, what about it? The Concorde had speed, too, and it didn’t catch on either. The thing is, I can already cross the country coast to coast in about five or six hours. There are very few reasons why I’d need to do it faster. I might like to, sure – but not enough to pay twice as much to do it. Some businessmen might, but they already have a nice way to do it faster: private jets that can go point-to-point and shave an hour or two off of that (more if you factor in layovers and TSA checkpoints). The thing is, the faster you’re already going, the less of an advantage more speed is. If you can cross the country in four hours, you’d have to double your speed to make it really worth paying more. Even then… how many of us value our time so highly that shaving two hours off of a four hour trip is worth thousands of dollars? Again, not many. The extra speed just isn’t worth much. Which means that hyperloops would be competing with an industry that’s already hyper-competitive. The tech is cool. But the market simply isn’t there.